I have a difficult time choosing music. On the one hand, I have respect for those who are masters of their craft. On the other hand, I identify with heartfelt lyrics and an impassioned performance. Finding musicians who are both masterful and vulnerable is like finding a unicorn. These rare individuals are listened to for decades and deemed timeless. Within seconds of listening, it is easy to determine that Eyedea is a highly-skilled DJ. He blends hip hop and rock in a way that is both seamless and surprisingly unique. For this alone, I give him a gold star. Don't be alarmed by the genre I've described; this is not your typical frat boy "rock rap" by any means. For example, his song "Spin Cycle" has some very Radiohead-esque moments. Vocally, he's on fire. He can spit words easily and with an even flow. There's a vulnerability in his voice, though many of the lyrics on this album seem amorphous. 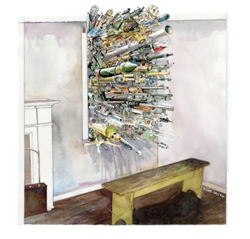 All of these songs will make your head nod, but "Burn Fetish" stands out as the track that combines the best of Eyedea's abilities and the most honest of sentiment. "Love is just a chemical by any other name" and "You're so much like me, I feel sorry for you" are just a few of the countless choice lines in this song. My favorite track is "Smile" because it is mellow, melodic, and hopeful. I selfishly wish he would make a whole separate album that sounds more like this track. I also wish he would do more musical interludes sans the vocals. No offense to his lyrical storytelling by any means; I just enjoy the sound he drums up in-between the words. By the Throat would be a great soundtrack for driving, sleepless nights, or getting through a difficult burden that you're obligated to work out.